Queenstown is an international resort town in Otago in the south-west of New Zealand's South Island. It is built around an inlet on Lake Wakatipu, a long thin lake formed by glacial processes that is shaped like a staggered lightning bolt, and has spectacular views of nearby mountains. There are various apocryphal accounts of how the town was named, the most popular suggesting that a local gold digger exclaimed that the town was "fit for Queen Victoria". It is now known for its commerce-oriented tourism, especially adventure and ski tourism. It is popular with young international and New Zealand travellers alike. The town is the largest centre in Central Otago, and the third largest in Otago. There are a few administrative functions (such as primary healthcare) that are currently administered by the neighbouring province of Southland. 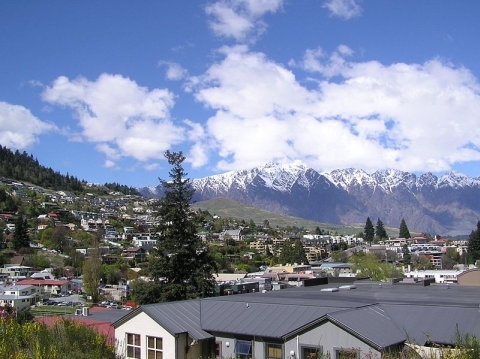 According to the 2006 census, the usually resident population of the Queenstown urban area (including Frankton and Kelvin Heights) is 10422, an increase of 22.1% since 2001. Its neighbouring towns and districts include Arrowtown, Wanaka, Alexandra, and Cromwell. The nearest cities are Dunedin and Invercargill. The Queenstown-Lakes District has a land area of 8,704.97 km² (3,361.01 sq mi) not counting its inland lakes (Lake Hawea, Lake Wakatipu, and Lake Wanaka). It has an estimated resident population of 26,400 (June 2008 estimate). 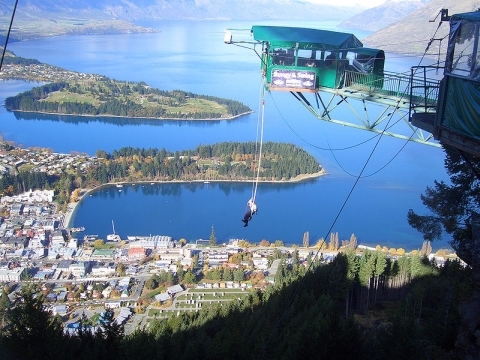 A resort town, Queenstown is a centre for adventure tourism. Skiing, jet boating, bungy jumping, mountain biking, tramping and fly fishing are all strong promotional themes. Queenstown is a major centre for snow sports in New Zealand, with people from all over the country and many parts of the world travelling to ski at the four main mountain skifields (Cardrona Alpine Resort, Coronet Peak, The Remarkables and Treble Cone). A coal fired steamship that is nearly 100 years old, called the TSS Earnslaw, provides tourist trips on the lake. In recent years, Queenstown's hostels have become a popular destination for tourists from all over the world. Queenstown provides adventure tourism during the day and a vibrant nightlife scene during the evenings. 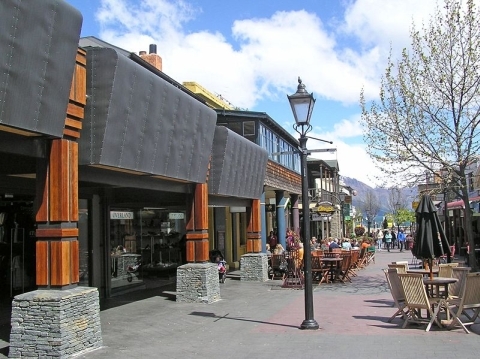 Locally, Queenstown has a reputation as one of New Zealand's wine and cuisine centres. Neighbouring, historic Arrowtown also features excellent restaurants and bars, and Queenstown lies close to the centre of a small wine producing region, reputed to be the world's southernmost. Pinot noir produced in this area fetches premium prices. Queenstown also now hosts an annual International Jazz Festival. Recent international performers include Anika Moa and Di Bird. Queenstown also has a reputation for being the 'Adventure Capital of the World'. Queenstown Airport has scheduled flights to Auckland, Christchurch and Sydney year-round and Wellington, Melbourne and Brisbane seasonally. Queenstown and the surrounding area contains many locations used in the filming of the Lord of the Rings film trilogy. Queenstown was used to film most of the 1988 film The Rescue. * A round of golf at Millbrook Resort - 150-year-old wheat farm, now a luxury resort. * Goldmining, Arrowtown, Central Otago history, sheep farming and Walter Peak station. Queenstown has an alpine climate with winters that have clear blue skies and snow capped mountains. Summer has long warm days with temperatures that can reach 30°C (2007/2008). Queenstown is accessible by road and air but not by rail. 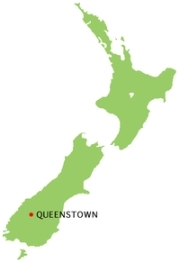 As a resort centre, there are many bus services that operate into Queenstown, with most being for package tours, but daily services for the local or itinerant are available to/from Invercargill, Dunedin and Christchurch which are the main cities closest to Queenstown. Queenstown has an international airport with flights from Australia by Air New Zealand and Qantas and in particular, from Brisbane, Melbourne and Sydney (the frequency is much increased over the ski season). Domestic flights operate from Auckland, Wellington and Christchurch. Due to sustained growth, expansion of the airport terminal was undertaken in 2005 and 2006, with more construction currently ongoing. Queenstown Airport is New Zealand's busiest helicopter base, and is also heavily utilised for tourist 'flightseeing', especially to Milford Sound and Mount Cook, using both fixed and rotary wing aircraft. The primary road access to the Queenstown area is via State Highway 6 (SH6), which travels from Cromwell through the Kawarau Gorge to Frankton, where a 9-km spur (SH6A) leads to the CBD and connects with the Glenorchy Road. SH6 continues south, crossing the Kawarau river before heading down the eastern side of Lake Wakatipu to Kingston before crossing the provincial boundary and emerging on the plains of Southland. A difficult road over the Crown Range leads to Cardrona skifield and Wanaka, and is New Zealand's highest paved public road. Queenstown is the departure point for a large number of day trips to the similarly famous Milford Sound which entails a return trip of approximately 12 hours. Panorama of the view from the Remarkables towards Queenstown Airport, with Queenstown beyond.